I love the Thanksgiving Day parade. 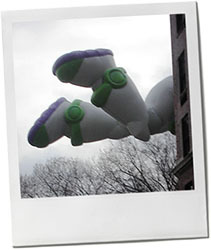 I love the strangeness of seeing the giant figures floating over the buildings of the Upper West Side. But more than this, I love the night before the parade,when the balloons are inflated in the grounds of the National History Museum. It’s a scrum. Of course it is. As soon as the schools are out and the sun goes down thousands of children conspire to gather under foot of any adult that happens to be in the vicinity. All it takes is one woman with a stroller, and we’re jammed with pedestrians from Central Park West to Broadway. The first year, Jon and I made the mistake of going early. The line / mob outside ShakeShack, snaking down several blocks basically prevented us from getting outside our front door. Now we have cocktails and snacks first, (a whole brie baked with a blob of cranberry sauce on top until gooey, perhaps) and head up there for the last half hour. In every way, this seems to be better. That is for tomorrow. But for today, less drinking, more cooking; I’m making cranberry relish in preparation of the big meal. 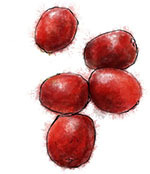 Now usually I make this version of cranberry sauce – tried and tested, no messing about. But last time I was back in the UK and noodling through my bookshelf I came upon an old recipe tucked away as a bookmark between the pages of Presumed Innocent. I guess because I’d seen the classic movie I’d assumed I’d actually finished the book, but no. Ten years on, and there it was. First I finished the book, then I made the cranberry confit, and it was too good not to share. The recipe was originated by Delia Smith, but it was covered in notes that I had made – I remember cooking several versions on the theme the Christmas after I finished cookery school. Where the spices came from I’m not quite sure, but whoever’s idea it was, it’s a good one. This entry was posted in Uncategorized and tagged baked brie, balloons, Christmas, cranberry, orange, Thanksgiving. Bookmark the permalink.